NASA has revealed that an asteroid entered Earth's atmosphere in December and exploded over the Bering Sea with an impact energy equivalent to 173 kilotons of TNT: 10 times that of the atomic bomb dropped on Hiroshima in 1945. It's the second time in six years that an asteroid this large has entered the Earth's atmosphere — a fairly improbable event, since NASA says meteors of this size only occur two or three times every 100 years. Since this meteor exploded high in the atmosphere over an unpopulated area it went virtually unnoticed. But it got me thinking: what would have happened if it had exploded over a city? I can't resist a good anxiety-inducing "what if", so I plugged the numbers into the Nukemap website (which simulates nuclear blasts) to see what would happen. As the target I chose the center of my home city, Portland, Oregon. I configured Nukemap to simulate a 173 kiloton blast at a height of 25.6km above the surface, with no radioactive fallout. The results? 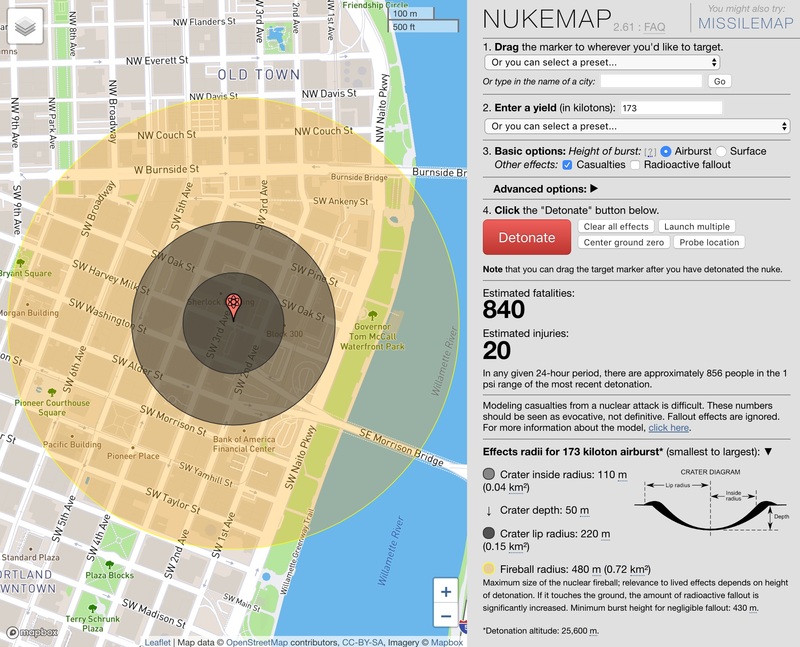 Nukemap estimates 840 fatalities and a massive 220 meter wide, 50 meter deep crater. But this is a very rough and probably inaccurate simulation, since it's tuned for nuclear weapons rather than meteors. As we learned from the Chelyabinsk meteor in 2013, damage would probably be spread along an elliptical area stretching dozens or hundreds of kilometers, and many injuries would be caused by secondary effects of the blast (damage to eyes and skin from intense light and UV radiation, injuries from broken glass and falling objects, etc). What can we do to prepare for situations like this? Probably not much. By next year NASA is hoping to be able to identify 90% of near-Earth asteroids 140m in size or larger, but that's many, many times larger than the Bering Sea meteor and the Chelyabinsk meteor. And even if NASA can spot a large asteroid, there's not much they can do about it other than predicting where the impact will be. 📷 Satellite view of the Bering Sea meteor in December 2018 (it's the tiny orange speck in the center). As long as we have Laser Cats, we should be fine. Seriously, I believe one of the ideas that came out of the “Star Wars” Strategic Defense Iniative of the Reagan years was the idea that we could use powerful lasers to pulverize the asteroid into harmless debris. The problem, as I remember it, is that we didn’t have the computing power required back then to calculate the flight paths of the debris after each lasering so that a huge chunk wouldn’t get through to Earth. Maybe all we need now is the computing power of an iPhone. That thought reminded me of Iron Sky. I believe one of the ideas that came out of the “Star Wars” Strategic Defense Iniative of the Reagan years was the idea that we could use powerful lasers to pulverize the asteroid into harmless debris. I suspect we are likely to see something a bit more mundane to deal with asteroids. As coverage increases we will likely be able to detect a problem years in advance and use something like an ion thruster to slowly alter its trajectory to deflect or miss Earth altogether. If you like sudden asteroid impacts, you should check out the Lady Astronaught series. So you'll get notified every time we have a close shave. Sleep tight. I don't know that we need to be worried, but we sure are going to feel stupid if there's a catastrophic event which might have been avoided had we only devoted more attention to contingency planning. It's probably safe to assume that our ability to detect threats will steadily improve, but we probably ought to be running tests to better understand the various methods of changing an asteroid's orbit. That seems preferable to sending Bruce Willis with nukes, though there might be a case for that in some circumstance. I don't know which is more astounding, that we may well have the technology to deflect an asteroid or that we are not doing much of anything to develop that capability. Maybe Elon Musk will work on it from Mars when he retires. I learned that mathematics is used to break up kidney stones, specifically using the properties of ellipses and ultrasound. I also learned that NASA has such machines on the space station. Which begs the question, could you use ultrasound or a combination of lasers and ultrasound to pulverize an asteroid? It’s moving really fast in space, so there’s that to consider. And then I found this talk from an expert on this very subject! The key thing is to know early enough that a rock is going to hit us. Then we have many options to choose from. The earlier the warning, the easier it is. If it's many years before, then a miniscule, light push can be enough as we would need to change the orbit just slightly. A few months before - and we might need to bring out the big guns (nuclear missiles?). A few days before? It would probably be too late to do anything. That's why a comprehensive 'low flying rock' survey capabilities are of the utmost importance.